At about 5:45pm today, I almost cranked up the ol’ WordPress and almost posted something titled “An Open Question To The Universe” the content of which was “How has my life become a series of such situations as ‘if I don’t figure out a way to get a 4′x8′ sheet of plywood mounted on the wall of a room in Chelsea I’ve never seen, by tomorrow morning, my entire company will not have email by November 30th?”. Shortly after I got home [decided to take the bus and ran into our condo-neighbor and had a very pleasant conversation; walked to the corner liquor store and bought a growler of Opa Opa IPA for me and a 2L bottle of Diet Coke for T] I got a phone call from a very helpful co-worker who let me know that (without boring you with the details) things might actually turn out OK in the aforementioned room in New York (which is my co’s new office location), plywood and internet-wise. Which was a huge relief. And once I got home, another unexpected treat awaited: a lovely little thing in the mail from the Sun Hill Press. You may know them indirectly; they are the folks who do the letterpress print work for Brookfield Stationery (whose stuff is found in many East Coast fine stationery and office supply stores). Darrell does the press work; his wife (whose name I am struggling to remember) does the design, and the Brookfield folks do the distribution/marketing/etc. Terri and I went to their shop (with the wee 5-month-old Rainer) last year on a Letterpress Guild of New England outing, and it was quite an inspirational creative space. From Elizabeth’s (yes! that’s her name!) lovely attic studio to Darrell’s massive Heidelberg press in the basement to the delicious lunch they fed the Guild members on a misty cold October Saturday in Western Massachusetts, it was a highly memorable visit. (They don’t really have a website, and there’s no way to buy it on Amazon. If you want a copy, though, they’re US$3, just comment and I’ll send you the contact info). Anyway, I felt a whole lot better about the universe by the end of tonight. Today I didn’t do a bunch of things I set out to do, and I ended up doing a lot of things I thought I wouldn’t do. Because of all of this action, I fully thought I was going to blow off the Sons and Daughters show at the Middle East (a Monday show– urgh, I’m old!). But I managed to wrap up the Nora printing project early, and through the magic that is California wash, cleanup now takes 15 minutes instead of an hour. So I decided, I had a ticket, why not? The very fact that it was a Monday show sort of suggested that it would be a pretty laid back affair where I could have a beer or two and maybe even sit down if necessary. X 2 [that’s X, the LA punk band, not the algebraic x] * Camera Obscura) + ( (Johnny Cash + The Clash)/2) + (The Jam * .25) + (Yma Sumac’s whip & eyeliner / Avogadro’s number). The guitarist had great hair. Terri bought a CD from him. There are those of you who live in the Boston area that I don’t know in “real” life, so I may not have told you that this Saturday, December 16, 2006, Terri and I will be at the Boston Bazaar Bizarre selling goods as the Rainy Planet Press. It’s from 1pm – 7pm. Come say hi. Admission is only $1, you can get lots of cool holiday shopping done, and while I don’t know much of the rest of the entertainment line-up, I have seen Hilken Mancini, and she alone is worth at least 10x the price of admission. My report on the Third Annual Print Arts Fair at the Museum of Printing in North Andover is up on my letterpress blog. Since the letterpress world largely still communicates through listserv, I decided the world needs a new letterpress blog, so that’s where I’m going to be posting news of my letterpress and other posts of general letterpress interest in the future. The two items of note: last week, my re-covered rollers came in, making the press more or less fully operational, and this Wednesday, I got a demo of a Versalaser, which I’m hoping will be an option for making custom plates. Mrs. RealFake and I are busily working on a printing project, which will need to be hand inked if the roller company doesn’t come through for me and mail me back my re-covered rollers in the next two days. Even the typesetting tonight was derailed for want of an at symbol. A sign of the times, I suppose, that at symbols are more essential to everyday life than they were when my beautiful vintage typefaces were cast. However, if it is a cents sign you want? I’m your man. Anyway, the want of rollers and frustration of the at symbol led me to an experiment I’ve been wanting to try for some time involving type and sculpey. It’s cooling in the kitchen while I kill time writing this. And now Mrs. RealFake is poking me and telling me it’s time for bed. I agree. Well, sort of. I had to fake it. I’ve still not been able to either buy new rollers or re-cover my existing (but moldy (ick) and deteriorated) rollers. So I bought a hand brayer and used that to ink the type. I just made a dumb little test thing, but I’m happy with the result. It looks like a Chance card from Monopoly. Since I still don’t have all the equipment necessary to get the press up and in service, I am keeping myself busy with various surrogates. I spent some time this morning rearranging the space in the basement I’m putting the press for now. Still need some better lighting, but that’s for another day. Went to Paper Source this afternoon for inspiration. 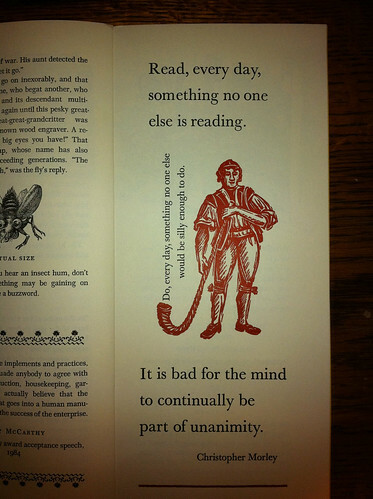 And I’ve just spend some time poking around the web for some letterpress links, which I post below. Apparently, Somerville is home to the Firefly Press, which has no website, but Elsa Dorfman’s site has a page for them, with a video. I like some of the stuff at Isle of Printing. I’m interested in the photopolymer process as a way to design stuff digitally and get cuts made. It seems better than metal for a variety of reasons (namely, durability, non-toxicity (well, take your pick between weird photo-chemicals and lead…), and storage (they’re way thinner than metal blocks)). Having limited space, storage is actually my primary concern. Boxcar Press seems to have the best explanation of photopolymer engraving I’ve found on the web. Seems pricey to get them to do it, though. I’m sure there’s a cheaper supplier, but as I’m learning, it seems like a lot of the printing world is either web-invisible, or outright web-hostile. 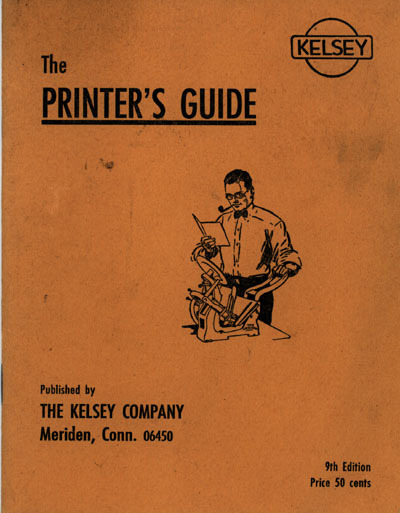 Among the documentation that I have with my press is The Printer’s Guide, published by The (defunct since 1990) Kelsey Company of Meriden, Connecticut. You may have guessed by now that I very much aspire to be the guy in the bowtie with the pipe. It’s from a different world: “…good results can easily be obtained by following these directions. If you have any difficulty, write to us explaining the trouble fully and clearly” (page 4). Terri and I went to Letterpress Things in Chicopee, Mass. today. Very glad we did. The owner/operator John Barrett was a gracious host and easily spent over an hour teaching us about the basics of printing and the basic things we need. As I suspected, I have almost all I need to get started, and he gave me some good leads on where to find the things he doesn’t stock, or, like rollers, that are harder to find. His space is a floor of an old paper factory, and he has dozens of old presses, and all sorts of various equipment that he’s purchased from closing print shops. But the big attraction is definitely John’s storehouse of information and his interest in helping newbies like myself. Unfortunately, the snow started a little earlier than expected, and we had to head back home before we managed to get to Lenox, Mass., to go to the yarn shop Terri wanted to go to. Well, there will be other trips to Western Mass. in the near future, I’m guessing. The ride back was another pretty snowy drive; not as bad as our snowy trip back from Portsmouth last week. But it was also quite pretty.